Ashley Simmons joined the Telecommunications Industry Association (TIA) in March of 2016. 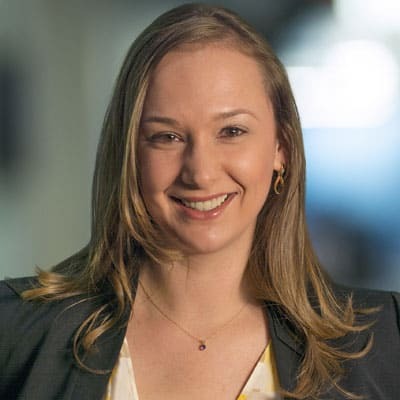 As the Vice President of External Affairs and Communication, Ashley leads TIA’s communications, public affairs, and campaign-based marketing initiatives across the association on behalf of its 250+ members advancing global connectivity technologies around the world. Ashley brings a decade of communications experience shaping strategies and executing issue-advocacy campaigns for global nonprofit organizations, political candidates, and Fortune 500 companies to TIA’s senior leadership team. Most recently she served as Director of Communications at the Intelligent Transportation Society of America (ITS America). In that role, she led the association’s communications department, focused on raising awareness among policymakers of the benefits of ITS technologies to transform vehicle and roadway safety, reduce traffic congestion, and increase mobility options. Prior to that, she led communications and public affairs at the Information Technology Industry Council (ITI), representing some of the most innovative technology brands in the world. Ashley resides in the Navy Yard neighborhood of Washington, D.C. and holds a master’s degree in Media and Public Affairs from George Washington University and a bachelor’s degree in Communications and Political Science from the State University of New York College at Buffalo. Find her on Twitter @AshleySimmonsDC.